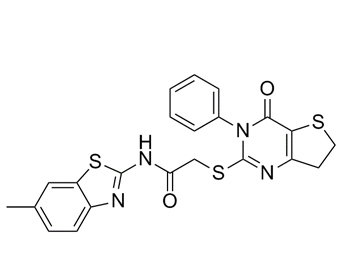 IWP-2 is a potent WNT-3A inhibitor. IWP-2 can decrease MKN28 cell proliferation, migration and invasion, and elevate caspase 3/7 activity. IWP-2 can also downregulate the transcriptional activity of the Wnt/β-catenin signaling pathway and downregulate the expression levels of downstream Wnt/β-catenin target genes in MKN28 cells. IWP-2 may be a potential therapeutic option for gastric cancer.
. Chen B, et al. Small molecule-mediated disruption of Wnt-dependent signaling in tissue regeneration and cancer. Nat Chem Biol. 2009 Feb;5(2):100-7.
. Chen Y, et al. Inhibition of canonical WNT/β-catenin signaling is involved in leflunomide (LEF)-mediated cytotoxic effects on renal carcinoma cells. Oncotarget. 2016 Jul 6.
. Mo ML, et al. Inhibition of the Wnt palmitoyltransferase porcupine suppresses cell growth and downregulates the Wnt/β-catenin pathway in gastric cancer. Oncol Lett. 2013 May;5(5):1719-1723.